Some argue that oil has been the single most important discovery in the history of modern Iran. It was more than a century ago that oil was discovered in the hills of Zagros and ever since every aspect of Iranian life has been affected by it. The primary interest of world superpowers in Iran is its oil. It was the main reason that Iran was involved in the Second World War. The allies invaded Iran to provide a supply line to the Soviet Union, as well as to insure a steady flow of Iranian oil to their countries and war machines. One of the outstanding moments in the history of Iran has been the nationalization of its oil industries by the great Mohammad Mosadegh. In sum, it could be said that nothing has influenced Iran in the past century more than oil. The development of the world in the 20th century has been completely dependent on the supply of oil and gas. No modern country can function without adequate and affordable access to these raw materials. However, the main question is the link between oil-based economies and development. To a naïve optimist, oil is a blessing, an undeniable source of wealth that can propel a country into a state of prosperity and success. On the other hand, a pessimist may view oil or any other natural resource as a curse. It can hinder the development of a country and render the society as well as the government oblivious to the problems at hand. The argument for considering oil a blessing is obvious. Take Iran for example: We produce 4 million barrels of oil a day, out of which we export 2.84 million barrels (making Iran the 4th largest exporter of oil). This constitutes 80 percent of all Iranian exports — the largest and most important of our exports. A considerable amount of Iran’s GDP is made up of oil revenue. Oil not only pays for government expenses, but it has also been the source of many subsidies that Iranians have enjoyed longer than they care to remember. Iran also has one of the largest proven oil and gas reserves in the world. At current extraction rates, Iranian reserves are estimated to last for many decades to come. It can be argued that oil is a treasure that can bail Iran out of many problems for years to come. The other good news is that in the years to come, there will probably be no downward trend in demand and thus no reduction in the price of oil. There will be highs and lows but the overall trend for oil prices will be upward. Although the current economic crisis has prompted oil prices to fall from record highs to an average of USD $40 per barrel, as the global economy comes around, so will oil prices. However there is another side to oil and oil-dependent economies, a dark and troublesome side that fundamentally questions reliance on oil. Oil severely affects the economy and the politics of a country, so much that many consider oil a curse. I will first describe the devastating effects oil has on the economy. Adam Smith postulated a concept known as “rent” in reference to unearned profits or income; or as he put it, “profits reaped by those who did not sow.” Economists regard rents as earnings in excess of all relevant costs, including the market rate of return on invested assets. Natural resources including oil, due to their limited availability, have rents, and this rent is what makes them so attractive as a source of income. In the 1960’s, “the rentier state” thesis was articulated by Hossein Mahdavi, an Iranian, to refer to the economy of pre-revolutionary Iran. In the 1980’s, Giacomo Luciani further developed this idea. A rentier state is a state that lives from externally generated rents rather than the surplus production of the population. In oil-exporting states, this is measured by the percentage of natural resource rents in total government revenues. Dependence is also reflected in export profiles, with oil in dependent countries generally making up from 60 to 95 percent of a country’s total exports. 85 percent of all Iranian exports are comprised of oil and oil-based products. Thus, by definition, Iran is considered a rentier state. There is a considerable amount of evidence to support this. Between 1970 and 1993, countries which were resource-poor grew four times more rapidly than countries which were resource-rich, despite the fact that these resource-poor countries had half the savings. (Auty, “Natural Resources, the State and Development Strategy,” Journal of International Development, pp.651-663). In the same period, OPEC members experienced an average 1.3 percent decrease in their per capita GNP, whereas lower and middle-income developing countries as a whole grew by an average rate of 2.2 percent over the same period. Among OPEC members, Iran has fared better. It has managed to maintain an average yearly growth rate of 3 percent (around the global average). However, the average per capita income of Iranians is still lower than 30 years ago. One of the biggest problems associated with high reliance on raw materials, including oil and gas, is the large price swings in world market prices. In 2008, we witnessed a classic example of this phenomenon. Oil prices, which had peaked at near USD $150 a barrel, fell almost $100 within two months. There are too many factors affecting the supply and demand of oil in the world. A rebel faction targeting an oil line in Nigeria can cause a price hike of ten dollars per barrel. On the other hand, speculation about China’s slowing growth rate can spark a drop in oil prices by tens of dollars per barrel. The result is of course a highly volatile oil market. This is very bad news specially for rentier states. Such price swings make longterm planning almost impossible. Take Iran, for example. In late 2007 and early 2008, boosted by high oil prices, President Mahmoud Ahmadinejad declared an ambitious program of eliminating government subsidies and replacing them by an $80 check to eligible families each month. However, the fall in oil prices put an end to such plans. Another problem plaguing oil-dependent economies is the poor links existing between resource and non-resource sectors. This essentially means that growth is insulated in oil and oil-based industries, leading to neglect and mismanagement in other sectors. However, the money generated by oil exports can be used to foster such links, as well as developing infrastructures upon which other sectors are able to thrive. Unfortunately many oil-exporting countries have failed to do so. Further, by mishandling oil revenues, a very hostile environment is created in other sectors of the economy. Iran again provides a good example. For years, starting from the pre-revolutionary era, the government has used oil revenue to import basic goods. This has severely weakened domestic sectors, including the agricultural one. To offset this, the government has been paying farmers subsidies and buying their products at higher than market prices. This however has considerably reduced the capacities of the agricultural sector and its ability to compete in global markets. The previous problem is part of a very well known phenomenon called “Dutch Disease.” Dutch disease means that oil windfalls can hurt other sectors of the economy by pushing up the real exchange rate of a country’s currency and thus rendering most other exports noncompetitive. Diminished competitiveness in agricultural and manufacturing exports crowds out other productive sectors and makes the diversification of the economy particularly difficult. This in turn reinforces dependence on oil, and over time it can result in a permanent loss of competitiveness. However, the misfortunes brought about by oil are not limited to the economy. The politics of a country is also highly influenced by oil. The windfall from oil cushions the mistakes made by governments. This means oil-exporting governments are rarely answerable to their people. Evidence shows that most oil-exporting countries are autocracies, or at the very best, factional democracies heavily plagued by fraud and mismanagement. Governments of oil-dependent states usually undertake overambitious development programs. One such program was initiated by the former Shah of Iran in the 1970’s and backed by high oil prices brought about by the Arab states’ oil embargo. The Shah took on an overambitious industrialization and development program that caused huge inflation in the country, led to rapid urbanization and slum development and finally brought about the fall of the Pahlavi regime. The state-centered approach associated with oil-dependent countries means that the private sector remains weak and uncompetitive. Politically-motivated appointments usually means incompetent CEOs running state-owned corporations to the ground. Furthermore, oil-rich areas have long been sources of dispute and conflict. 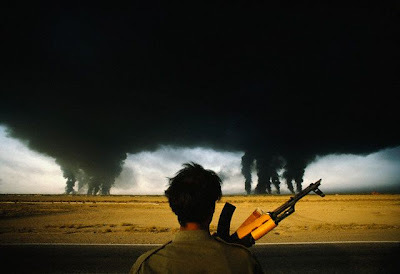 The damage inflicted upon Iran during the eight years of the Iran-Iraq war over oil rich Khuzestan was estimated at near a trillion dollars. This far surpasses the bulk of wealth oil has ever produced for Iran. Oil exploration, extraction and production have other serious effects: They impose a heavy burden on the environment. During the process of oil production, natural habitats are destroyed. Oily salt water is discharged, which frequently pollutes fresh water sources. Oil spills and sludge contaminate the environment for decades. The flaring of associated gases produces toxic fumes, and so on. I understand why so many are against further drilling in Alaska in search of oil, as it can irreversibly destroy the wildlife there. In Iran, there are plenty of examples as well. Masjid-e-Soleiman is a city in southwestern Iran. One of the oldest oil production sites in the country, it is known as the cradle of oil in our country. Last year, the city was declared to be in a state of emergency, as it is slowly sinking in the unstable ground beneath it. For many years now, oil has leaked to a sandy plateau that the city is based upon. It is almost too late to save the city. The Caspian Sea is another example. As a consequence of excessive pollution produced by oil rigs, especially those in Azerbaijan, the sea is in a state of biological emergency. So when I hear the Saudi oil minister, Sheikh Ahmad Yamani, state that “I wish we had discovered water,” I just can not help but agree with him. I can end this here, probably leaving you disillusioned about the riches oil has brought Iran, but I will proceed to providing simple solutions that can turn around this glum outlook. I am a pragmatist. S o to me, oil is neither a blessing nor a curse. It is merely an opportunity that should be made the most of. Interestingly enough, Islam has provided clear guidance on dealing with land, natural resources and depletion of minerals. In Islam, it is believed that since God has created the earth, land in its natural form, with no improvements by man, belongs to everyone in society. This applies to minerals and natural resources as well. Islam is adamant not only about intra-generational justice, but also inter-generational justice. Thus if the current generation is benefiting from the revenues of oil, future generations should also have access to sustainable sources of revenue. So under Islamic guidance at least a part of current oil revenues must be saved and invested, domestically or abroad, to even out the Net National Product (NNP) and to avoid a decline in national output in the future. However, in an oil-based economy, if the income from oil is consumed (and, as is the practice, if oil output is counted as a part of NNP), then NNP declines as oil reserves are depleted. In a sense it could be said that Norway and the U.S. state of Alaska are more Islamic in their handling of oil than a country like the Islamic Republic of Iran. Oil can have a positive impact on development if governments can capture the value of their resources and make the best use of the revenues generated through their effective management, distribution and utilization. Five countries (Australia, Canada, Norway, the U.K., and the U.S.) rank at the top of a variety of governance indicators. Although they hold only 5 percent of all proven oil reserves, they are using their natural resources to the best effect. On the other hand, 12 countries (Algeria, Angola, China, Iran, Iraq, Kazakhstan, Libya, Nigeria, Russia, Saudi Arabia, Venezuela, Yemen) rank at the very bottom of governance indicators, but they hold more than 68 percent of the world’s proven oil reserves. Norway is a notable example of good governance. Norway has a political system that is based on egalitarian views. Based on such views, it has managed to restrain itself from spending the oil windfall and instead has been saving it as capital in a Government Petroleum Fund. The fund is used to finance investments on infrastructure as well as subsidizing social services such as healthcare and education. The best way to manage oil revenues is to place all oil revenues into a fund; invest the resources of the fund; issue a check to every citizen from this fund (the amount calculated in a conservative manner and subject to change annually in order to ensure the same real benefit to all future generations); and allow the government to borrow up to a fixed maximum percentage of the fund at an annual cost to be paid to the fund. There are formulas that can calculate the saving rate for oil dependant countries. In the case of Iran, the saving rate is calculated at around percent, which means 60 percent of oil revenues should be captured in a national fund. In Iran, a few years ago, such an attempt was made by establishing a foreign currency fund to capture the surplus of oil revenues. However, until now, the government has failed to achieve the 60 percent saving rate. Morever, it has extensively used the savings in the fund, making the fund practically ineffective. During the price hike of 2006-2007, Arab states such as Kuwait and Saudi Arabia managed to save almost a trillion dollars each in their national funds. In the same time period, Iran has barely added to its foreign currency fund. The situation is so grave that the actual amount in the fund is considered top secret. Hopefully this will be changed as the fund is destined to change to the “National Development Fund,” with more restricted access imposed upon it. Such a fund is the first step in escaping the rentier state. The Iranian economy is however in desperate need of an overhaul. I will not address the necessary reforms nor will I address the necessity of political reforms as they are out of the scope of this article. However change and reform is what Iran needs right now. I want to be an optimist, especially as the Persian New Year is upon us. A new president has taken office in the United States with promise of change. Soon there will be presidential elections in Iran. So who knows, maybe change is around the corner here too. This entry was posted on March 21, 2009 at 8:09 pm and is filed under Oil, Rentier State. You can follow any responses to this entry through the RSS 2.0 feed. You can leave a response, or trackback from your own site.